Greeting loyal readers and fellow maremmas. Mummy found the following article on a place called “Stuff“. 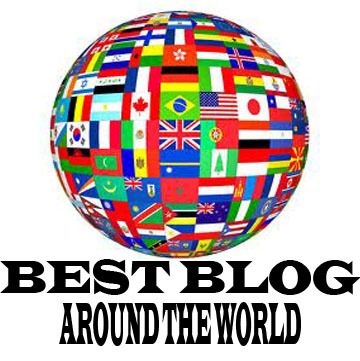 We three do not know of this place, but mummy says it is full of news and other stuff and you can while away a few hours. 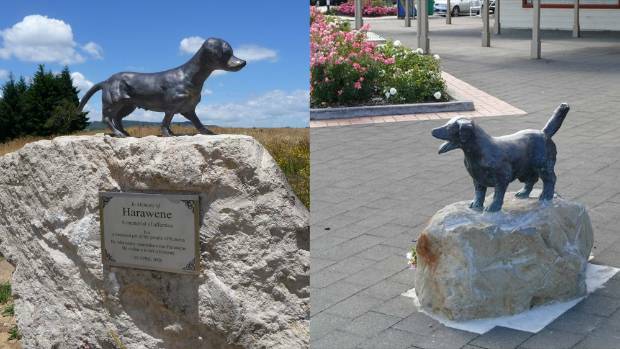 We hope you enjoy reading about all the doggy statues there are in New Zealand. Love the three bestest maremmas in all the land. Majestic dog and scenery: the sheepdog memorial at Lake Tekapo. 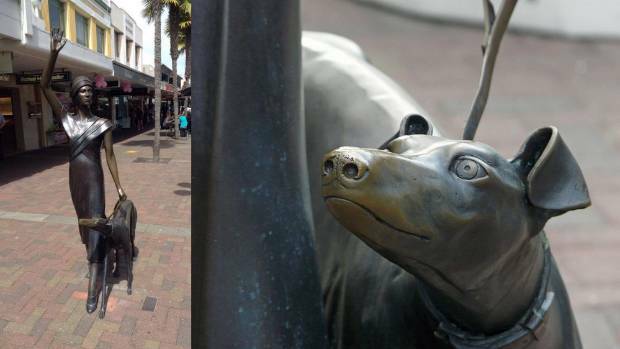 The other day I saw a dog sculpture in a little New Zealand town (more on that below). And I wondered, how many other pieces of public art are dotted around New Zealand that feature a dog? Well I looked into it. And I discovered that there are a lot – you could do a Dog Sculpture Tour of New Zealand and be busy for weeks. Why so many? I think it’s because dogs are deeply imbedded in life in this country. Farming, hunting, exploration, the outdoors – dogs helped build this country! You couldn’t record or celebrate life in New Zealand without giving dogs their due. And I’m glad that, in terms of public art, we do. 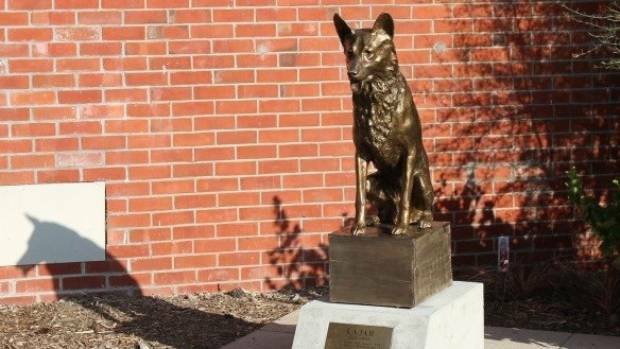 Rajah the wonder dog is memorialised in Methven. 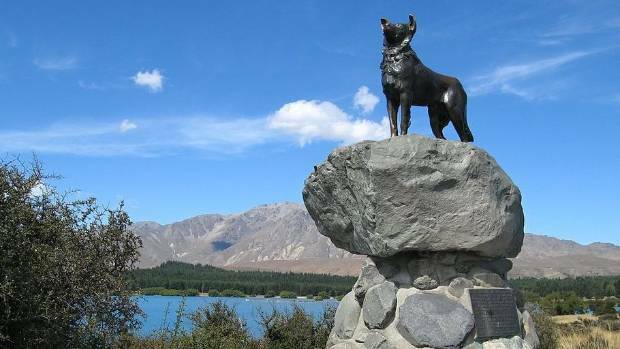 Probably the most photographed dog statue in New Zealand is the Sheepdog Memorial at Lake Tekapo. It has stood since 1968 as a memorial to the dogs who helped form and keep alive the farms of New Zealand. The bronze statue is fittingly glorious, depicting a border collie (the breed brought from Scotland by 19th-century settlers) atop a rock with head high and ears cocked. The Tekapo collie was created by sculptor Innes Elliott, basing his work on a sheepdog named Haig. Sheepdogs also get due recognition with statues at Hindon in the Taieri Gorge (a collie named Sue) and at Roxburgh, where there’s a state of a farmer and his dog, created by Bill Clarke. One man and his dog, times two: James Mackenzie and Friday in downtown Fairlie; an unnamed drover and his unnamed dog in Feilding. 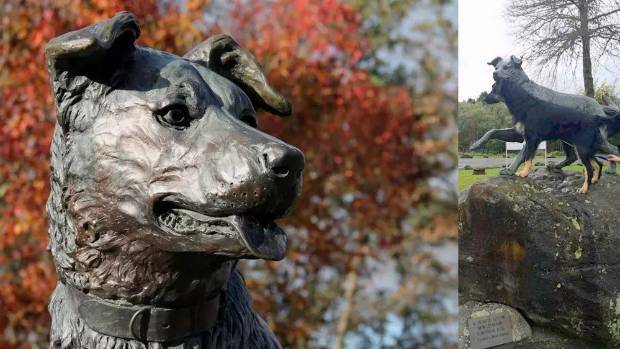 Not too far away, if you’re spending a weekend visiting dog statues, is the one of James Mackenzie and his dog Friday, in the town of Fairlie. Mackenzie was the supposed sheep rustler who kept escaping custody in the 1850s and disappearing into the great expanse of land that now carries his name. 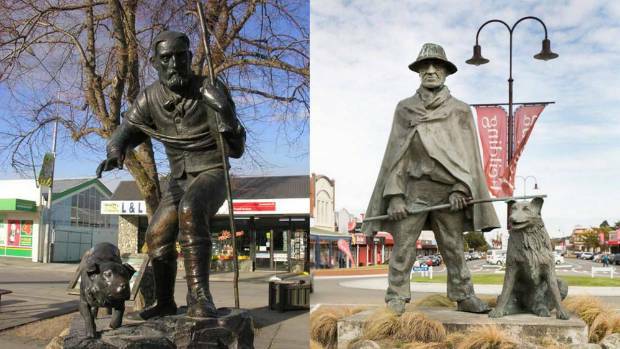 The statue of a drover and his dog in Feilding doesn’t mark a specific life, but locals see it as a landmark that captures the spirit of their farming district. The statue, by John Fuller, was featured as one of a series of New Zealand stamps a few years ago, putting it on a level with Ohakune’s carrot and Te Puke’s kiwifruit. Many of the rural dogs depicted in these sculptures are collies. But in the almost-aptly named North Island town of Hunterville, you’ll find a shrine to the other breed that helped build the country’s early farms – the huntaway. The sculpture, installed in 1999, is low enough for flesh-and-blood dogs to climb up and share their bronze pal’s view. The Hunterville Huntaway: alert face, and accompanied by flesh-and-blood visitor Skye. As far as I can tell, huntaways didn’t originate in Hunterville, but the town has proclaimed itself Huntaway Capital of the World. And why not? The town hosts a yearly Huntaway Festival that includes obstacle courses (humans plus dogs) and a barking competition (strictly dogs). By the way, I’ve been meaning to say… why doesn’t Treasury put a huntaway on a bank note? Is anyone with me on this? Back to sculpture. 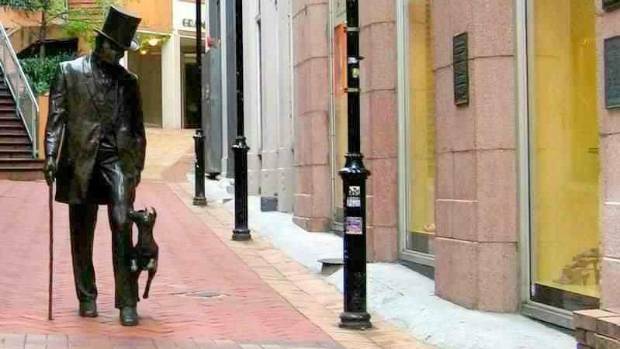 Last year, a statue in recognition of Antarctic sled dogs was installed in Lyttelton. The sculpture, by Mark Whyte, celebrates the contribution to the port town of the exploration of Antarctica and the Southern Ocean. “The Sled Dog symbolises the courage and comradeship of all those involved in this continuing endeavour,” the plaque says. John Plimmer and his dog Fritz, at the bottom of the Plimmer Steps in Wellington. Quite a few statues mark the closeness of human and dog, either generally or specifically. In Hastings stands a statue of the prominent citizen William Nelson, hatted and bearded, with his eager dog a foot or two away. With this sculpture, by artists Gillie and Marc, you can actually go up and be alongside the figures – plinths seem to have gone out of fashion in public sculpture, in favour of human-scale closeness. The sculpture “Barry, a Kiwi Bloke” in Katikati is one of the interactive sort. The bloke of the title sits on a park bench, reading a newspaper. If you like, you can sit next to him. On the other side of Barry is Jack, his dog. The low-key artwork was made by Donald Paterson, Barry Menzies and Mick Cassidy. The Napier lady with her devoted dog – a sculpture titled A Wave in Time. One of my favourite dog-plus-human artworks is in central Wellington. At the entrance to the alley that takes you up the Plimmer Steps is a bronze of the man for whom the steps were named, John Plimmer. Running next to him is his little dog Fritz, tail and ears flying. Unlike the other statues, in this one the human and the dog are looking at each other, and so close as to be made in a single piece. If you sit at the Starbucks on the opposite side of Lambton Quay, you’ll see passing tourists taken by surprise by this very human, delightful sculpture, and stopping to take photos and pose with it. John Plimmer and Fritz was created by Tom Tischler, Ross Wilson and Judy Alexander, and unveiled in 1996. Relaxed bloke, attentive dog: Katikati’s statue of Barry on his bench, and Hastings’ memorial to founding figure William Nelson. I also like A Wave in Time, a statue by Mark Whyte that stands in Napier’s shopping centre. It shows an elegant woman striding along with an adoring greyhound in tow. The woman is modelled on Sheila Williams, who led the New Napier Week Carnival in 1933 to mark the city’s recovery from the earthquake of 1931. Christchurch’s three bronze Corgi dogs getting up to mischief. Right, a dog is part of Hamilton’s Farming Family sculpture. Another great example of human-scale, or dog-scale, public art is in Tauranga: the set of sculptures based on Lynley Dodd’s characters: Hairy Maclary, Bitzer Maloney, Bottomley Potts, Hercules Morse and others. Brigitte Wuest brought the characters to life and they’ve been installed at a place where children can pretend the cartoon creatures are part of their games. Then there’s Wal and Dog from Footrot Flats. 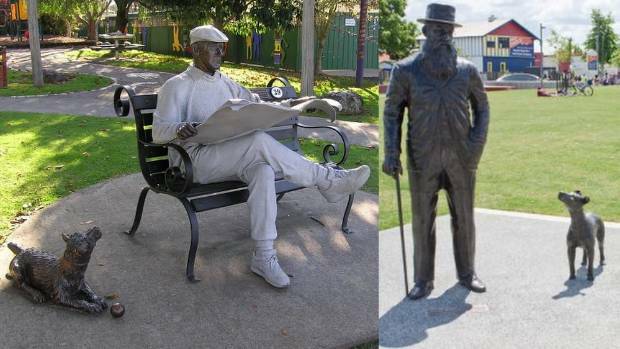 You can stand with the Murray Ball characters at a park in Gisborne, where they were placed last year after Weta Workshop created them. I suppose the worst case scenario with accessible public art is that, well, someone will nick it. 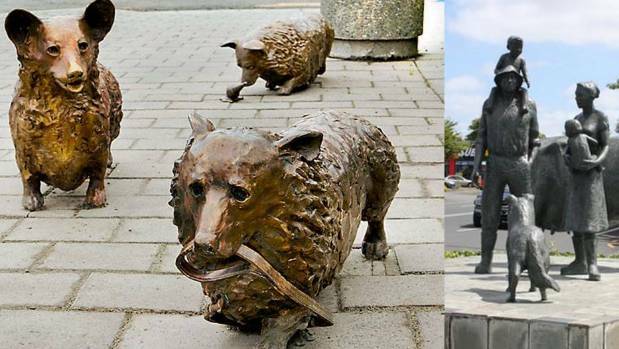 That’s what happened to one of three bronze corgis after the Christchurch earthquake of 2011. Sculptor David Marshall had to remake one of the dogs before the set could be put back on the High Street site they’d occupied since 2003. A closeup of Dog, from the bronze sculpture of Wal and Dog made by Weta Workshop. 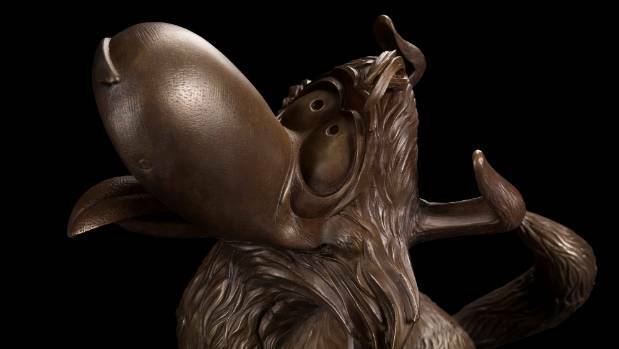 The sculpture stands in Gisborne, the hometown of Footrot Flats creator Murray Ball. Dogs have inspired less literal, more abstract art works. 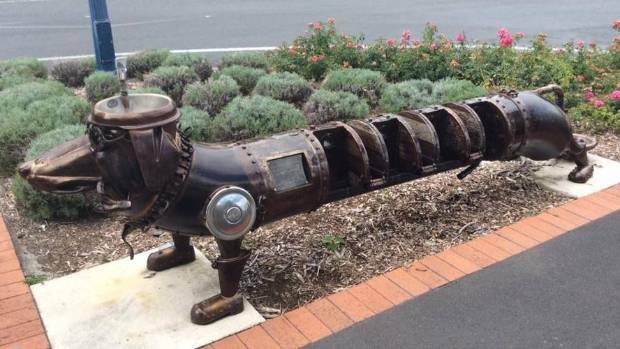 In Dunedin, Stephen Mulqueen’s Kuri/Dog sculpture is shaped from railway-sleeper-type pieces and set on tracks – but the canine spirit is still in it. In Hamilton, visit the Tongue of the Dog statue – though it might take you a moment to cotton on to its abstract shape. It represents the loving spirit of a servant dog who, according to a Maori legend, saved his human’s life by cutting a path for curative waters to flow from the land of her birth to reach her; that waterway became the Waikato River. The tall sculpture is by Michael Parekowhai, and stands at the entrance to Waikato Museum. Also in Hamilton for dog-statue completists is a statue depicting a farming family: a man and woman carrying young children, and standing with a cow, a sheep and a sheepdog. Sir Robert Jones donated the work to the city in 1990. Hamilton’s art sculpture in Victoria Street called Tongue of the Dog. Occasionally, a sculpture is dedicated to one certain dog. An example is the one devoted to Rajah the wonder dog, in Methven at the entrance of the Mr Hutt Function Centre. The artist, again, was David Marshall. According to a local website, Rajah was owned by police constable Robbie Robertson and lived in Methven from 1929 to 1936. Though Rajah was never an official police dog, he was famed for being able to find lost objects and understand commands. 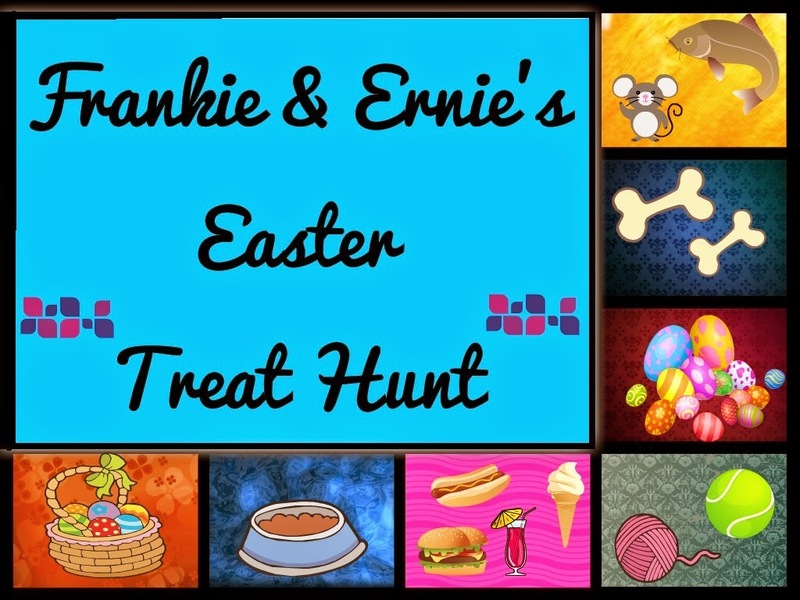 In the south Taranaki town of Manaia in 2007, a little Jack Russell terrier named George became a hero when he fought a pair of pitbulls that were threatening a group of five children. His attempts to protect the children meant the dogs attacked him, and afterwards he had to be put down. The dogs (and cat) of Lynley Dodds’ Hairy Maclary stories are caught up in a game at Tauranga’s waterfront. George received two medals in posthumous recognition of his bravery, one of them bestowed on his owner by the then governor-general. Now, a bronze statue to George stands in Manaia. Harawene was the name given to a stray dog who lived for 15 years by the side of Te Ngae Road in Rotorua. 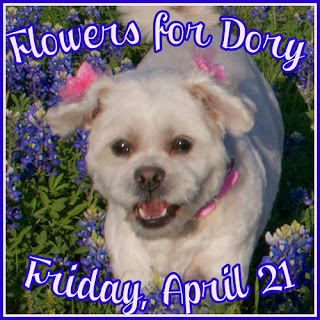 She was “nobody’s dog”, but everybody around knew her, and many helped care for her. Local heroes: Rotorua’s Harawene, left, and Manaia’s brave George. After she vanished from sight in 2008, local sculptor Trevor Nathan went to work on a memorial sculpture. It now stands next to the street where Harawene was often seen. There’s one more dog statue I want to mention. It has its own category, and I saw it for the first time last week in the town of Te Aroha. It’s a giant bronze steampunk Dachshund that serves as a bicycle stand and drinking fountain; surplus water dribbles out its bronze “pizzle”. I loved it, and not only because it features my favourite dog breed. It’s fun, and it does a job. 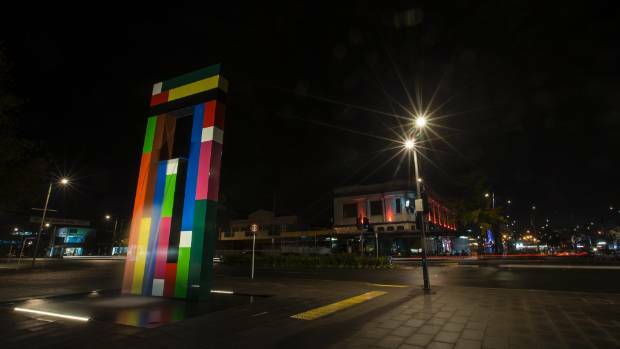 I had to dig around for details about it – the Piako Post reported that it’s the work of sculptor Adrian Worsley and is part of a push by Te Aroha to become New Zealand’s most cycle-friendly town. The sausage dog that serves as drinking fountain and bicycle rack in Te Aroha. Dog sculptures – are there any I’ve missed? 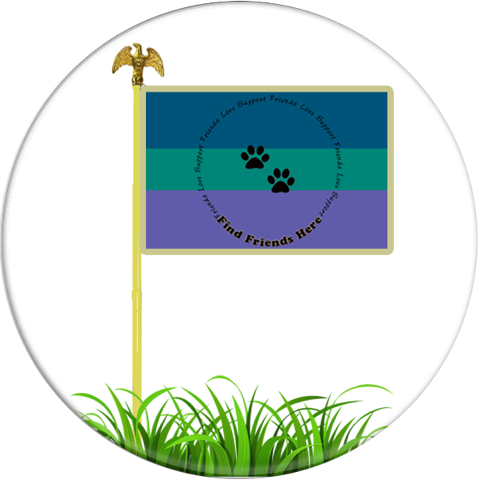 Join Four Legs Good on Facebook. Follow the daily photos of #connorandphoebe on Instagram. 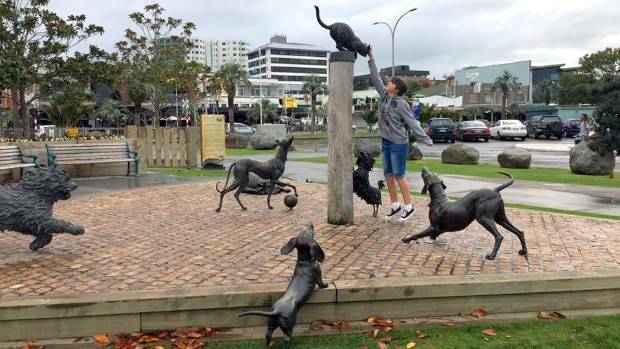 This entry was posted in Uncategorized and tagged dog statues of New Zealand. Bookmark the permalink. Wow…what a wagnificent batch of dog sculptures! Thanks for sharing them. Too cool. Hope to do more in the future! There should be statues of Kaci and Kali called “good dogs”. that is the art I love… and it is so beautiful to biggyfie the photos to see all the little details…. they are made with love!!! I think my fav is all the dogs chasing the cat! Wow! I had no idea New Zealand was so doggified! I love it. Have a happy day, Maremmas and friends. Thanks for posting this, what a great read and marvellous to see so many working dogs celebrated like this. I live in Tauranga and I can tell you that it’s not only small children who have fun with Hairy and his friends!